Homeowners that desire a healthy and beautiful lawn, should opt for lawn fertilization in Gretna. It’s the product of successfully executed lawn care procedures, one of which is lawn fertilization in Gretna. If you want a lush turf, why not invest in professional lawn fertilization in Gretna? Our licensed applicators at Heroes Lawn and Landscape have the skill to bring your vision of an exceptional yard to fruition. Before lawn fertilization in Gretna can be done, several factors must be considered: grass type, yard condition, and weather. These can all be determined by our specialists in lawn fertilization in Gretna. Using our extensive knowledge in garden maintenance, we can decide the right mix of nutrients for your grass type. 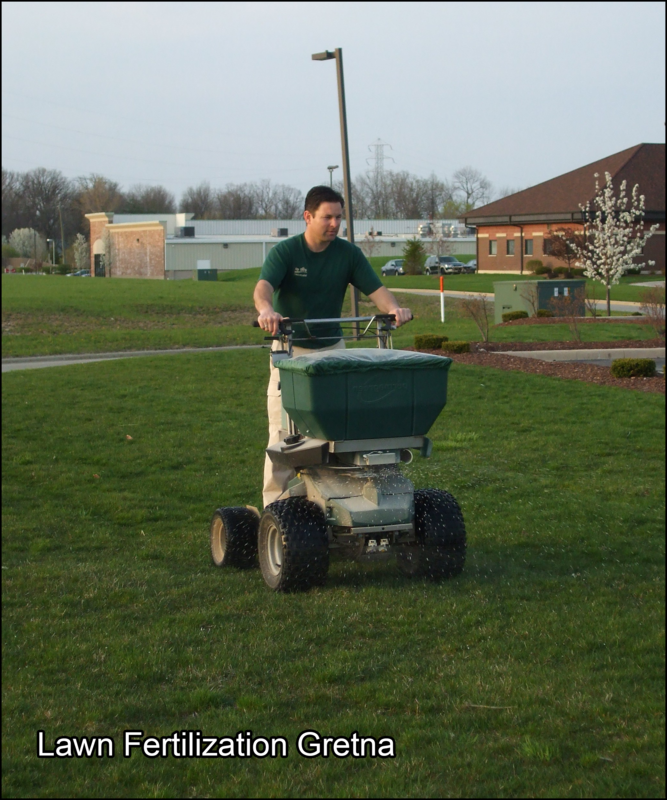 We can also determine the kind of fertilizer and weed control that best suit your turf. Wrong implementation of these procedures will hinder your grass from reaching its full potential. This won’t be a problem if you hire our providers of lawn fertilization in Gretna. To achieve optimal results, lawn fertilization in Gretna has to be timed appropriately. Failure to properly schedule lawn fertilization in Gretna may result in an undergrown or overgrown yard. Our five-step program for lawn fertilization in Gretna is composed of carefully picked treatments for every season. Whether it’s for spring, summer, autumn, or winter, we know which fertilizers and control products are best to use during our lawn fertilization in Gretna. Lawn fertilization in Gretna reduces weed growth. Increasing the amount of nutrients in the soil allows your landscaping to thrive. As the green turf thickens, weeds are prevented from taking root. Potential infestations are then eliminated. If you see your garden plagued by unwanted grass, consider having it controlled then performing lawn fertilization in Gretna. Lawn fertilization in Gretna promotes a cleaner environment. Once weeds are eliminated, your yard has more room for healthy plants. The more green plants there are, the greater protection you have against urban dust and dirt. These plants also produce more oxygen, allowing fresh and clean air to circulate in your property. This makes your garden a great place to de-stress and rejuvenate. Lawn fertilization in Gretna keeps your property from getting muddy. Rain can turn bare yards into a muddy mess. This causes great stress given that it makes your property appear untended and unappealing. Luckily, you can prevent this with lawn fertilization in Gretna. With regular lawn fertilization in Gretna at the correct intervals, the roots of your grass will eventually strengthen. As a result, it becomes better at absorbing water. If you have a patchy or bare yard, opt for lawn fertilization in Gretna. Lawn fertilization in Gretna adds value to your investment. Your home is one of your biggest investments. Lawn fertilization in Gretna can increase its market value by beautifying your garden. Upon seeing your tended lawn, home buyers will likely think your property is well cared for. This increases your prospects and may hasten house selling for you in the future. With lawn fertilization in Gretna, you get to add beauty and value to your property. Give your lawn a makeover by hiring our licensed applicators. At Heroes Lawn and Landscape, we deliver optimal results while protecting your loved ones and the environment. To learn more, view the rest of our site pages. Heroes Lawn and Landscape is a company that brings new meaning to the term, “full-service.” We are much more than just a landscaping company. Apart from landscape design, we also offer lawn care, lawn maintenance, mosquito control, and holiday lighting services. We know how tedious it is to have to hire different companies to handle all aspects of landscaping, lawn care, and outdoor lighting. Our goal is to save our clients time and energy by providing a one-stop solution to all of their outdoor improvement and maintenance needs. The patch of land behind or in front of your house can serve a wide range of purposes. With our help, it can become an extension of your home or a showcase for your ornamental plants. We can turn a humble backyard into an outdoor entertainment area by installing a custom-designed patio, and make hard-to-reach outdoor areas more accessible by constructing garden paths. By installing hardscapes such as retaining walls and steps, we can make your lawn or yard more functional and visually appealing. Keeping grass, plants, and trees beautiful and healthy requires regular lawn maintenance and fertilization. However, looking after your lawn can be difficult when you have other responsibilities, such as work and family. With our help, your Gretna backyard can become a pest-free oasis. We take great pride in our comprehensive mosquito and tick control strategy. Our team won’t just spray your backyard and call it done. We will actively monitor pest populations and weather conditions to adjust your treatment for the best possible results. Save time and money by having Heroes Lawn and Landscape install turf on your lawn instead of grass. You won’t have to fertilize, mow, or water your lawn again! What’s more, synthetic turf is easy to care for. It’s also pet-friendly. Learn more about how we can transform your outdoor spaces into showcases by giving us a call. You may also request a quote by filling out our online form. We look forward to helping you achieve the lawn or yard of your dreams. Call us today for lawn fertilization Gretna!